Configure and manage the Insight 8-Port 1G Managed PoE+ Smart Cloud Switch from NETGEAR virtually anywhere in the world with support for the NETGEAR Insight App. With this network management app available for both iOS and Android devices you can take advantage of a variety of features including one-touch setup, one-touch monitoring, and one-touch management. In addition to managing this Smart Cloud Switch, you can also manage multiple wireless access points, switches, and network storage devices both locally and remotely. 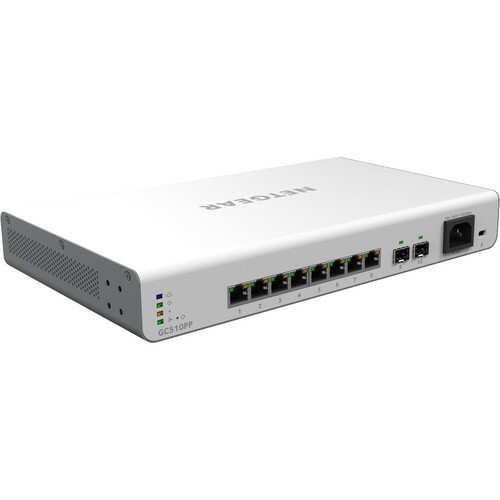 This Insight 8-Port Smart Cloud Switch features a 195W PoE power budget and comes equipped with eight Gigabit copper PoE+ compatible ports and two dedicated SFP ports. The 802.3at PoE-compliant ports make it easy to power a variety of PoE-compatible devices such as access points, IP phones, and more. Once installed, the switch features 20 Gbps full-duplex bandwidth, a 1.5 MB buffer size, a 16K MAC address table, and support for up to 256 VLANs. Box Dimensions (LxWxH) 17.9 x 10.0 x 3.4"